Simply Pam: Happy Trails to You! Here is a birthday card I made for my uncle. 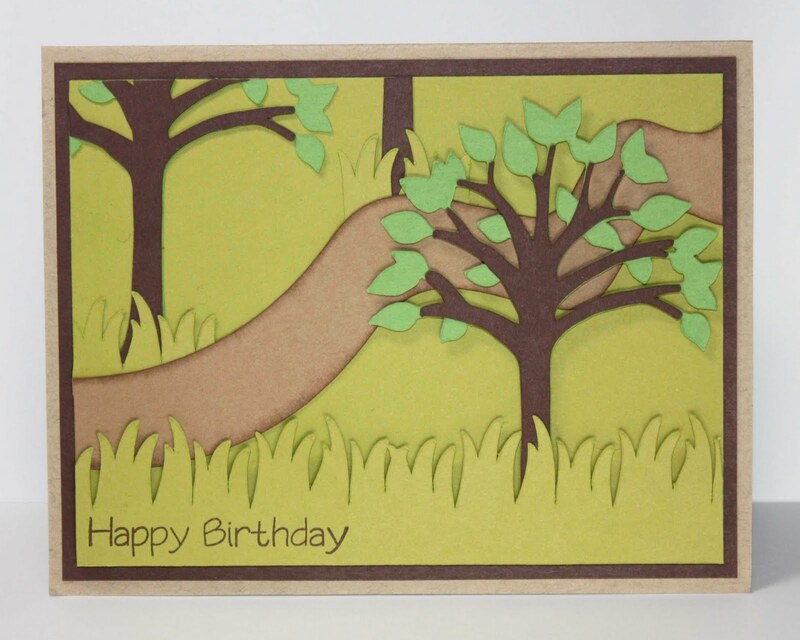 He loves hiking and nature so I thought up this card. The trees are from the ZooBalloo Cricut cartridge and the grass is from the Straight from the Nest cartridge. I couldn't find the path that I liked so I searched in my Gypsy for a wavy line and found this one. It is from Home Accents. It lists it in my Gypsy as a line. I unlinked all of the measurements and set it at 8x30" and then only cut about half of it. It worked out great. The image is image 9 in the shift position. This is one great advantage to the Gypsy or Design Studio. You can make something that you need out of something that doesn't make sense. The birthday sentiment is from the My Pink Stamper's Family & Friends stamp set. The paper is from PTI. Don't forget about the Blog Hop w/ Giveaways this Saturday!!! I love how you made the card with the person's interests in mind. Great job! Pam...this is a very pretty card. I do too love my G and CDS...so many things you can do w/them. I am looking for some grass on my cricut. That is so funny. I like how you pulled your card together. Great card. I love butterflys and would love to win the stamps and kit too. Thank you for all you did as a My Pink Stamper Design Team member. Robyn is such an inspiration.